So, the comic is going to be on a bit of a hiatus for a while. Here’s why. Hey everyone. It may seem like I had fallen off the face of the earth, and it wasn’t too far off from the truth. It’s taken me two weeks to finally get to a point where I could actually concentrate long enough to type something to talk about what’s happened in the last few weeks here. 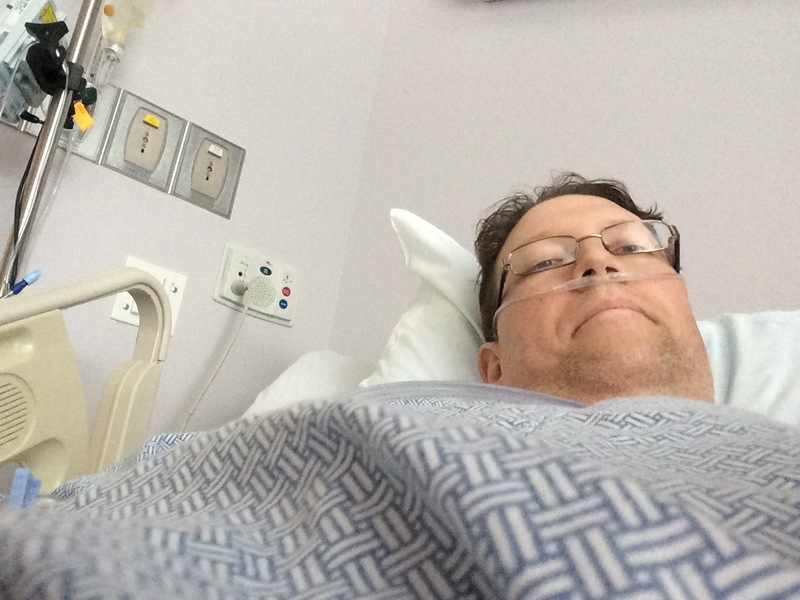 For the short answer, two weeks ago I ended up in the Emergency Room at the local hospital and had to stay in the ICU for a week. Now for the long answer. Three weeks ago, I had a nasty pain in my right leg. It felt like a pulled muscle or tendon. It was nasty to walk on. I had my doctor take a look at it while I was seeing him for my quarterly diabetes check. He didn’t see anything out of the ordinary, but said that if it was still bothering my in a week, to come back in. That was Tuesday, September 9th. The pain never went away, so the following week, I was planning to see the doctor again… but life beat me to it. It’s Monday, September 15th, around 7:45am. I’ve just dropped off my mom at work and made my way over to my office. I got out of the car and started walking toward the front of the office. About halfway there, I got extremely dizzy and short of breath, to the point where I couldn’t walk any more. I stopped, put my backpack and things on the pavement and sat down, laying on my back. Fortunately for me, the wife of a doctor that is in the area saw me on the ground in the parking lot and she called her husband who rushed over and called 911. Minutes later a police car showed up and then the ambulance arrived. I remember getting into the ambulance and driving off, but after that, the next thing I remembered was waking up in the ICU. I’m told that when they got me to the ER, the paramedics had ended up doing CPR on me for over 90 minutes. In that time, I had been in full cardiac arrest at least twice. A group of brilliant doctors had been in the ER when I came in so I have 4 doctors all working on me. It was found that I had a blood clot in my right leg that had broken off and gone through my heart and into my lungs. It was a really bad situation. According to their past experience, normally someone with what had happened to me would have died (and I kinda did, twice) but somehow those brilliant doctors and the ER staff performed a miracle. Most things didn’t work and they had to try what they consider a last resort. They ended up using a drug on me that the doctors said they had only seen work one other time in all the years that they had been practicing doctors. The week that followed was a week pain and suffering in the hospital’s ICU. I started to hear the stories about what happened and I’m still not EXACTLY sure what all happened between the ambulance and the ICU. A blood clot, the same thing that took my brother Jeff from us, nearly took me from this world. But like I said, somehow I survived. Now, I have a long road back to “normal.” I’ve been home for almost a week now. It’s hard to do things still. Walking is a chore. Breathing can be hard. Eating is still proving to be difficult after the ordeal. It will probably be months before things get close to back to normal. I can’t really go back to work for a while. And when I’m finally able to, I’ve been ordered by the doctors to limit that to like a hour or two at a time. What that means is that I’ll be out of it for a while. I’m trying as best I can to keep up on things, but it’s proving to be hard as all this recovery goes on. So if I don’t respond to things, at least people know a bit of the why. 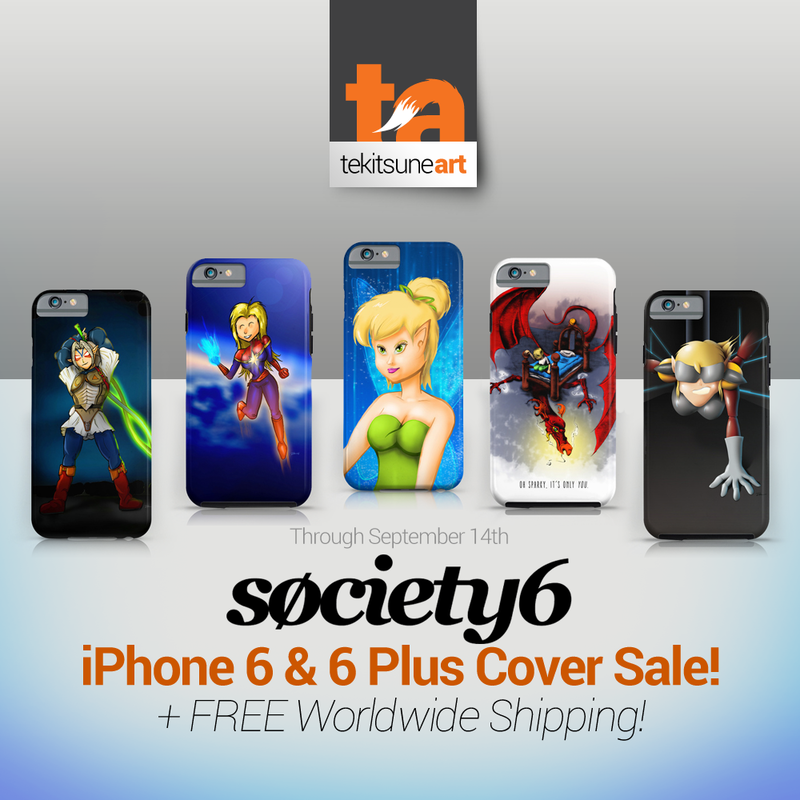 For all the iPhone 6 fans, Society6 is having an iPhone 6 cover sale! Save on new covers and get some free shipping too! Visit the site using my link below and save today on one of my designs! Deal is good through September 14th, so do it now! Don’t delay! Comments Off on Society6 Sale Time! It’s finally here. I decided after finishing up SDCC this year to go ahead and pull the sheet back and let the foxes loose. Foxtails, Inc. is now LIVE! I’ve posted the first comic and I’m hoping that I can keep things going at least once a week. I’m looking at Tuesday updates, so be on the look out there. Hope everyone joins Kit and Kat on their crazy journey to no where in particular. Thanks for joining us! Comments Off on Welcome to Foxtails, Inc. I think I have most of the design pieces finished up for the Foxtails, Inc. website. Once I have that done, I’ll be able to turn attention to story and art and stuff. You know, nothing major, right? (Daunting task to try something new again… I’m hoping I can get it going properly. Not too much to it right now, just the one throwback from the original site (that never really went anywhere because I ended up concentrating on Beyond Neverwonder.) Still need to get info pages set up too. That’s an update for today. More when I get closer. Comments Off on Foxtails, Inc. Website is almost READY!